It persuaded me just a little with its $7 clearance price tag. That small red tag pushed me from simple infatuation to head over heels in love. Which is why this lovely dark blue and white tablecloth with the huge gingham checks jumped into my hands and came home with me. I couldn’t wait to put it on my little table. Do you know the difference between the hugely popular buffalo plaid and gingham? Buffalo plaid is a larger square plaid of two colors… one is always black and the other is your favorite color. Gingham, on the other hand, is made of two colors of thread woven into a check pattern, though white is usually the constant with one other color. Who knew that two threads of blue and white woven into a huge check pattern could make my knees so wobbly? And if that tablecloth wasn’t enough… the placemats that I’d seen a few weeks earlier were still waiting for me on the shelf to travel home with me, too. I think I danced all the way to the checkout and out the door to my car with my new blue table accessories. Dark blue is my new passion. AND…. a major player in the transformation I’m giving my tiny apartment. Oh my goodness, I can’t WAIT to show you. Pinky finger promise… it won’t be long. It’s going to be lovely. Well, at least it is in my mind’s eye. Just last night I finished painting my cream and mauve and green plaid ottoman. 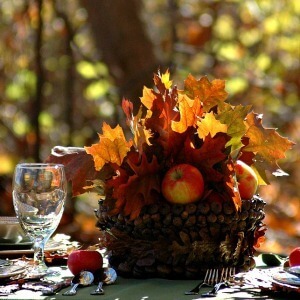 While I was dreaming and scheming my new color… yes… scheme… I set my table for fall. These bright rusty orange dollar store plates just popped set against the dark blue placemats. Clay-colored dessert plates I had picked up at Hobby Lobby back in the spring for 90% off (I know! How does that even happen?!?) were perfect to place on the dinner plate to keep the blue and white theme going. And because I was still smitten with the sunflower napkin rings I made, I just had to thread these sweet blue and cream ticking napkins through the rings to grace the plates for yet another combo of my current color faves. It’s simple… colorful… and seriously… makes my heart happy. Every. Single. Day. My bestie saw those when she was at Trader Joes and brought them over to me late one night on her way home. They are called, Eggplant on a Stick! And they are so stinking cute I can’t stand it. Originally they were on tall stems, but I chopped them down to size for my table and slipped them into a clear mason jar. So simple and so fun! Oh, how they make me smile! Every morning, noon, and night, I’m greeted by this cheerful table as I pass through to my kitchen. You know… it really is the little things that make a day extraordinary. That’s why I’ve been on a mad tear to get my living room pulled together with my transformed thrift-store finds. I could keep living with just the bare minimum necessities. and making it into something extraordinary. What kinds of ordinary fill your home and life? What would it take for you to take what’s ordinary and make it extraordinary? This table setting will be perfect for a casual dinner gathering, even Thanksgiving. More fall ideas await you HERE and below. I can see why you danced all the way! But checks of almost any color and size always catch my eye. Can’t wait for you to keep your pinky promise. Wow, I love all your tip and knowledge of the difference in blues. I love your tablecloth and setting. Hmm, you got me thinking. I REALLY love the blue with the fall colors!! Really makes those oranges and yellow pop. My neighbor grows those mini pumpkin ‘things’ and gives me some every year. They dry really well so I have some that I can use over and over! Your table looks beautiful, Diane, and I love how you’re incorporating that gorgeous blue into your home decor.